Back in January, I went one evening to one of our two local McDonald’s to get some dessert for the family. We especially like their little hot fudge sundaes. Nicely portion controlled, tasty, comes with a little package of peanuts to put on it. What isn’t to love? But, when I ordered them, I was informed their ice cream machine had broken down and they could not provide cones, shakes, or sundaes. Sigh. I was also told the repairman was coming in a couple of days. The next time I happened to be there, which was about two weeks later, they had placed a printed piece of paper on each of the speakers, letting customers know they didn’t have ice cream. Hum….must be quite the break down I thought. When I was there last Friday (about two months after the original “breakdown,”) the signs were up for the annual shamrock shake promotion, but the increasing weathered paper about not having ice cream and “sorry for the inconvenience” were still up on the speakers. At that point, I was done with the insanity. It would be like them saying they couldn’t put cheese on a burger for two months, or being out of ketchup for two months. There is a set menu. As an owner of a McDonald’s franchise you are supposed to provide your customers the ability to buy those things that you advertise you have, that EVERY McDonald’s advertises having. I understand the occasional problem, but two months? I got on the McDonald’s website that day and made a customer comment. The comment asked why this particular restaurant was allowed to be without ice cream for so long, even as the corporation spent millions advertising their shamrock shake promotion. I apparently got someone’s attention. Eldest Daughter and I were out running errands today and I stopped at the problem McDonald’s to get happy meals for lunch (again, portion control!). I noted that the weathered printer paper was gone. Then as we pulled forward in the drive thru, we saw someone pushing an obviously used ice cream machine out the back door. 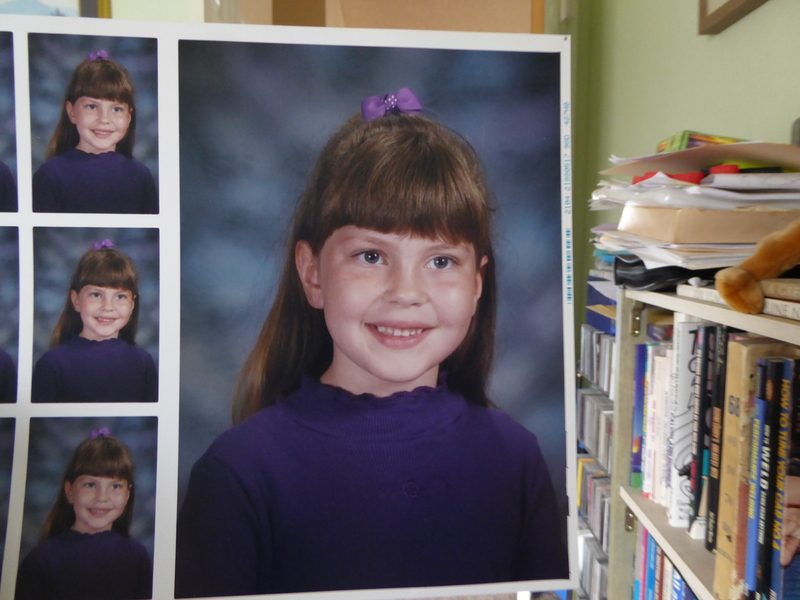 I turned to eldest and asked, “Coincidence?” We both shrugged. Who knows, maybe those ice cream machines were on back order. The world may be falling apart but, darn it, my neighbors and I will be able to have soft serve ice cream while it is happening. For my trouble I got a coupon for a Big Mac and an Egg McMuffin in the mail. Ironic, isn’t it, that I didn’t get a coupon for ice cream. I know it is spring when…. I know it is spring …. When any puddles in the drive way dry, they always leave behind a yellow ring of pine tree pollen. When I see my first aerial battle between a mockingbird and a red tail hawk. The mockingbird is trying to drive the hawk away from its nest. Those mockingbirds are amazing, the way they go after a bird that is so much bigger and has such a sharp beak and talons. The sound of weed eaters becomes a constant accompaniment to my life (like right now). How do you know it is spring in your neck of the woods? Navel orange trees are shaped so that they are pretty free of branches from the bottom to about seven feet in height. You can duck down under the branches and then stand up under the tree. We needed to get the rest of the oranges off the tree, so I ducked under to get inside and reach more oranges. The tree was in full bloom and as I plucked off oranges heavenly smelling orange blossoms were raining down on me. I really can’t think of many things as delightful as that. I have a spot on a wall next to my computer that would be perfect for a huge bulletin board. I have a need for someplace to organize things and I was thinking a bulletin board might be just the thing. Here is the problem, though. I am worried that stuff will be put on the board and then never be taken off. So I was reluctant to spend good money on a bulletin board and then not use it. However I went in a thrift store this week and they were having a 90% off yellow tag sale. They had a bulletin board and it had a yellow tag! It was a little beat up, but I got it for 48 cents. At that price, I can experiment, see if it works for me and, if it doesn’t, I can just re-donate it. Thrift store score! Slowly but surely, we are getting the weed situation under control after all of our winter rain. The back back was buzzed by our lawn guy. Much or the property at Mom in law’s house was buzzed by Hubby tie weekend. I have been going around our yard and pinching or pulling the weeds that managed to make it through the mulch. We won’t let the weeds win! LOL! We have descended into cat chaos. The kittens, who are now almost two years old, are flexing their territorial muscles. Something must have happened while we were go on our short trip to Universal Studios that put Blackie out of sorts. When we got back, he started urinating all over the house. First it was the front bathroom, then the master bathroom, and then he settled in to using the corner of the dining room as his litter box. Yee gads, it is horrible. We had two litter boxes in the garage, and for a year and a half they have used just the one big one in happy harmony, That happy harmony is all gone now. We added a third litter box to the garage, and that did nothing. 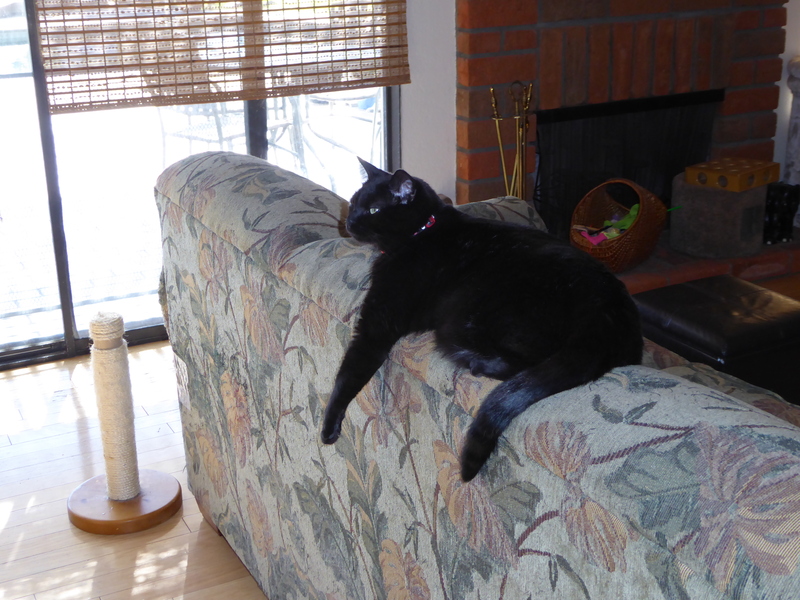 Tuesday I spent the day following Blackie around and insisting he go in the garage boxes. He did four times. But there were still times he went in the dining room. Finally, Tuesday night we broke down and moved one of the ignored boxes from the garage to the dining room. Blackie has been using it, praise the lord. But I now have a litter box in the dining room. Then, Wednesday morning around five am, Blackie came in to the bedroom and I gave him his early morning snack. Iwent back to bed and he finished eating and strolled over to get up in bed with me. 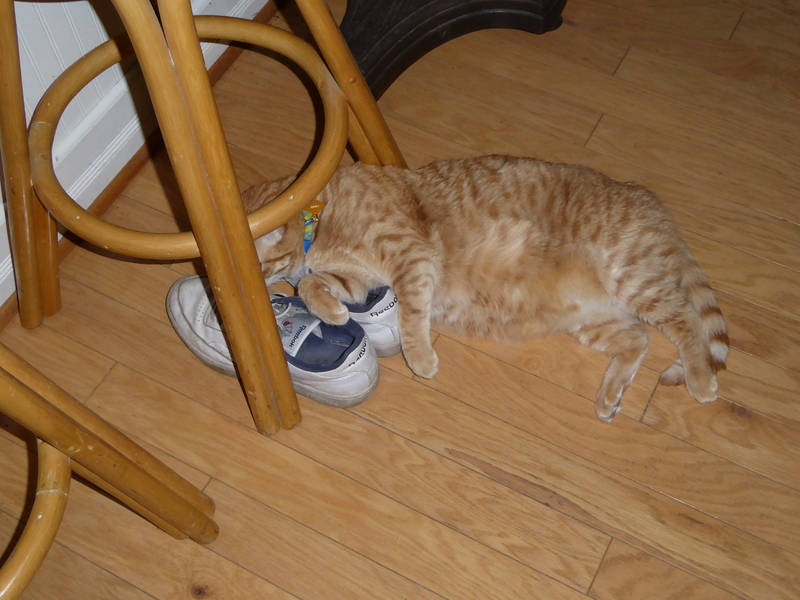 He must have felt a little tummy trouble at that point because he threw up…right into my slipper! Chaos, I am telling you it is cat chaos around here! Hubby and I doubled down, me in a pet shop and him on the internet. I bought yet another litter box as well as the manager recommend product to get out the cat urine smell from my dining room. Hubby bought some plug in things that are supposed to release a cat pheremone that has a calming influence on cats. I just need to buy thirty pounds of litter to fill up all the boxes. Meanwhile, Nox and Lumos are happily spreading their excretions among all the litter boxes. Blackie actually used the usual one in the garage today. HE acted like nothing had changed. Just strolled in and did his thing. Meanwhile, after just a month free of random animal pee in my house, we are right back at it again. I won’t be able to have guests over if their keeps up. “Please come over and have dinner with us, two feet from a cat box, while the sent of cat pee from my carpet wafts over your meal.” Meanwhile, we are scared to death the kittens will decide that the corner of the dining room is their preferred place to go for the next fifteen years. I love my cats but I can’t take this madness. I can remember going on the tram ride at Universal Studios when I was quite young and it was the ONLY thing to do there. I still enjoy the tram ride and so does the rest of my family. We made sure to go on it the first day we were at Universal Studios. The ride lasts about an hour, so keep that in mind when thinking about meals, bathroom breaks, and small children. The ride now includes two interactive parts that are like a ride, which were very enjoyable. 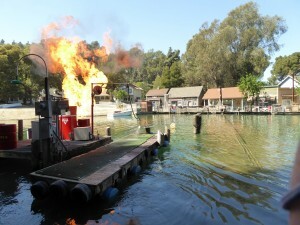 The rest of the ride is about showing off the back lot, sound stages, and sets. You experience a real but fake rain storm and flash flood, as well as a gas explosion with real fire and a shark attack. The fire is surprisingly close and hot! 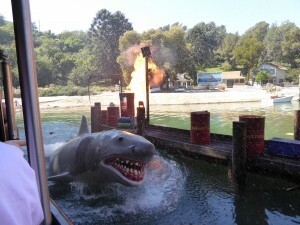 And then comes the shark! It was a hot day, so we decided to enjoy a frozen butterbeer and a cauldron cake. Again, the girls thought the butterbeer was divine and I thought it was very sweet. The cauldron cake was delightful, and really looked like a cauldron. I thought it was a must if you love chocolate. But, together with the butterbeer it was just too much sugar for me all at once. This photo doesn’t do the cauldron cake justice. 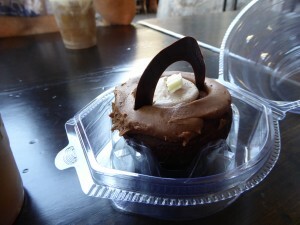 It was dipped in chocolate on the bottom and even had four little chocolate legs to stand on. The afternoon of our first day, we looked at a wait time board and discovered that the line was just 10 minutes long for the Forbidden Journey ride. Oh boy, after missing it that morning due to technical difficulties, we were excited. We hurried over and got in line. The odd, and totally weird thing about this ride is it doesn’t have anywhere for you to put your belongings. If it doesn’t fit in your pocket, you have to get a locker (which you have to pay for) to put your things in. I have no idea what the designers were thinking. Needless to say, the locker room is madness with folks trying to find an open locker tangling up with folks trying to get their belongings after the ride. Really, madness! We didn’t have this problem as Hubby and I went through the line to see the various displays along the way (which was worth it, BTW) but we weren’t planning on going on the ride. I read in many places that the ride was a motion sickness nightmare and I was not interested in testing my internal fortitude, after a close call the last time I rode Space Mountain at Disneyland. So, we gathered up the girl’s purses and such and went off to the shop while they rode the ride. There we waited and waited, saw the folks come off the ride we had been in line with, and waited and waited some more. My mom-sense told me there was a problem and I was just trying to figure out what to do to find them when Eldest and Youngest finally appeared. It seems the ride almost got the better of Youngest and she had to wait for a while near a conveniently placed trash can before she was sure all was well and she could move again. So, if you have issues with motion sickness DO NOT GO ON FORBIDDEN JOURNEY. Eldest had her eyes open for most of the ride and said it was pretty good, but she felt it was practically designed to make you sick. Not on purpose, but just because they don’t have the technology quite there yet. If you feel you will do OK on the ride, she said it was pretty cool. Youngest said she was glad she now knows what the ride is all about but will never go on it again. FYI, they have a single rider line, to make waiting go a little quicker, but if you go in it you will miss the displays along the way. Save that for your second time going on the ride. 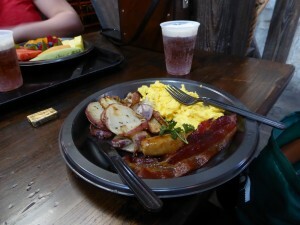 On our second say in the park, our main goal was to eat lunch at the Three Broomsticks. We managed to catch it at just the right time and there wasn’t too much of a line. 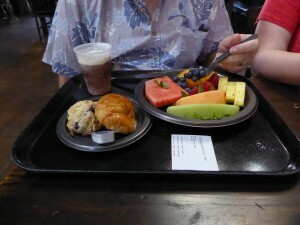 Unlike breakfast, each lunch item has a separate price and they do not come with a drink. 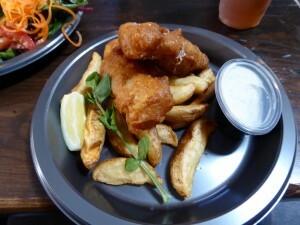 Three of us opted for the Shepard’s Pie and Hubby got the Fish and Chips. I am afraid I didn’t pay much attention to the prices, but they were in the $13 to $16 range. Drinks were $3.95. Everything was tasty, and a decent portion size. My only complaint is that my drink, pear cider, was a little weak. 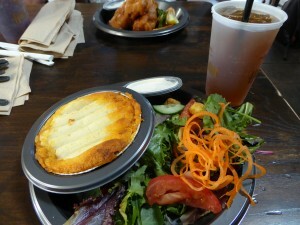 This is my Shepard’s Pie with Salad and pear cider to drink. After exploring HPW some more, because we couldn’t get enough of it, We walked about other parts of the park and went on the Jurassic Park ride. It was fun and, because it was once again a hot day, we didn’t mind getting wet. Protect your belongings, however, as they will get wet, too. There is an area at Universal with a Simpson’s theme. Not surprisingly to anyone familiar with that show, it had a whole lot of places to eat. We stopped and two of us got ice cream and two got a giant donut with Oreo cookie crumbles on top. Yum! 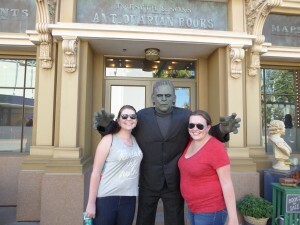 Before we left, we got a photo with Frankenstein, capping off a fun getaway to Universal Studios Hollywood! When it became obvious that a trip to Walt Disney World was not going to happen this spring, mainly due to everything being up in the air about the health of elderly pets and how difficult it seemed to try to coordinate the schedules of four adults, I decided the family should still do something to get away for a few days. I suggested we go down to Los Angeles and visit Universal Studios Hollywood and their new “Wizarding World of Harry Potter.” This idea went over well, as my family are all Harry Potter nerds from way back. Reservations were made, tickets were bought, and all we had to do was wait for March 12th for the fun to begin. On a good day with smooth traffic, Disneyland is less than an hour from our home. Given all the freeway construction, good traffic is rare, but, still, it seems like an easy drive to get there and back. Universal Studios is more like an hour and 20 minutes in ideal circumstances, but, with LA traffic being what it is, even without freeway construction, it took two hours to get there. This is why I decided we should get a place to stay so we could have a more relaxing time. We arrived Sunday afternoon, checked into our hotel (which I will not be naming due to some issues….no free publicity from me, but, also no blog shaming, either, as I have a feeling the problems we had were isolated.) We used the free shuttle to go to Universal City Walk where we enjoyed looking at stores and having dinner at Jimmy Buffet’s Margaritaville restaurant. Our package allowed us to get into Harry Potter World (which I will call HPW from now on) an hour early. As all travel sites recommended, we got there a little early, and were towards the front when the ropes went down and we all hurried to HPW. Unfortunately, the whole reason we were hurrying was to get on the big HPW ride, Harry Potter and the Forbidden Journey, but it was down for repairs. Being the good travelers we are, we did an immediate pivot and went on Flight of the Hippogriff. It is a cute roller coaster but the ride is less than 30 seconds long. One of the shortest roller coaster rides I have ever been on. On the plus side, we got to see Hagrid’s house, his motorcycle, and an anamatronic hippogriff, Buckbeak, who figured significantly in one of the Harry Potter books. Unless you really want to go on the ride as you have small children and/or have hit all the rest of the highlights of HPW, try to get on it when the line is on the short side, say under 30 minutes. We were still in our magic early hour so we went over and got in line at Olivander’s wand shop, to see the wand ceremony. You can go in the shop and look at all kinds of wands without being in line, but you do have to wait to see the ceremony. We waited somewhere between 20 and 30 minutes, but the family all thought it was worth it. It truly felt like a scene right from the book as a child was plucked from the audience, handed a couple of wands that didn’t seem to suit, before being offered a wand that was the “right one.” The person selected (usually a child) gets the wand for free. This could cause some jealousy, if you have another child in your party. But, buy them a $45 wand and much will be forgiven, I am sure. 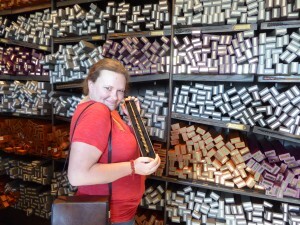 FYI, we loved looking a the wands, but we resisted the temptation to buy one. 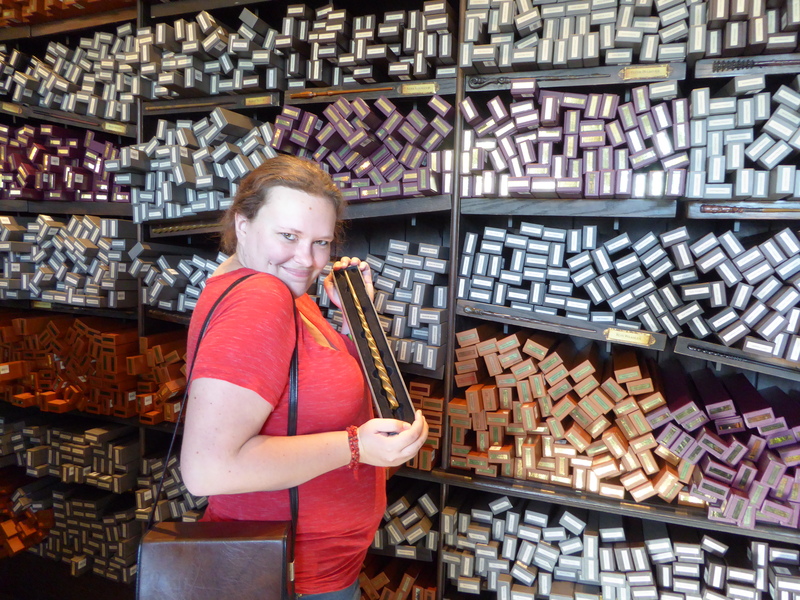 Olivander’s shop has LOTS of wands! Speaking of wands, I have to say, having children of all ages, including those still in strollers, waving around strong, skinny, blunt sticks of wood that could do quite a bit of damage should something go horribly wrong, added a bit of danger to our visit I had never felt at a theme park before. But that is just me and my Mom-sense talking. 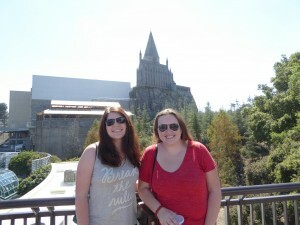 We experienced no incidents or even near misses involving wands. After all of that, our morning snack we had eaten back in the room was long gone so we went to the Three Broomsticks for breakfast. It is the only restaurant in HPW, although there are lots of food carts set up though out. There were several breakfast choices on the menu for breakfast, all costing $12.99 and all coming with our choice of beverage. We all got cold butterbeer, of course! Not to worry, there is no alcohol in butterbeer, a favorite drink at the real Three Broomsticks in the Potter books. My daughters thought it was to die for. I thought it was very sweet and tasty, but not so wonderful I had to go to HPW just to have butterbeer. I had the eggy bread, which was thick French toast with bacon and syrup. 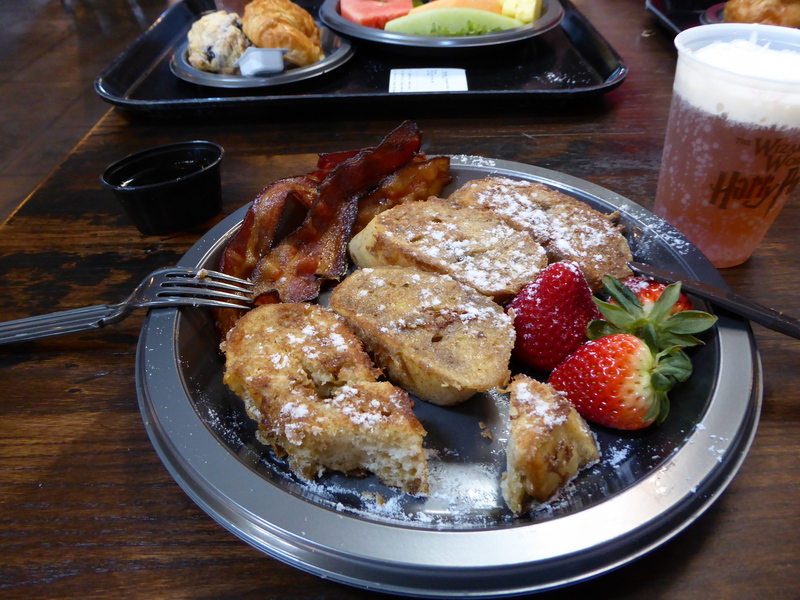 Youngest Daughter had the American breakfast, which included eggs, bacon and sausage, and potatoes. Hubby and Eldest had the continental breakfast which came with a plateful of fruit, a scone, a croissant, and jam and butter. 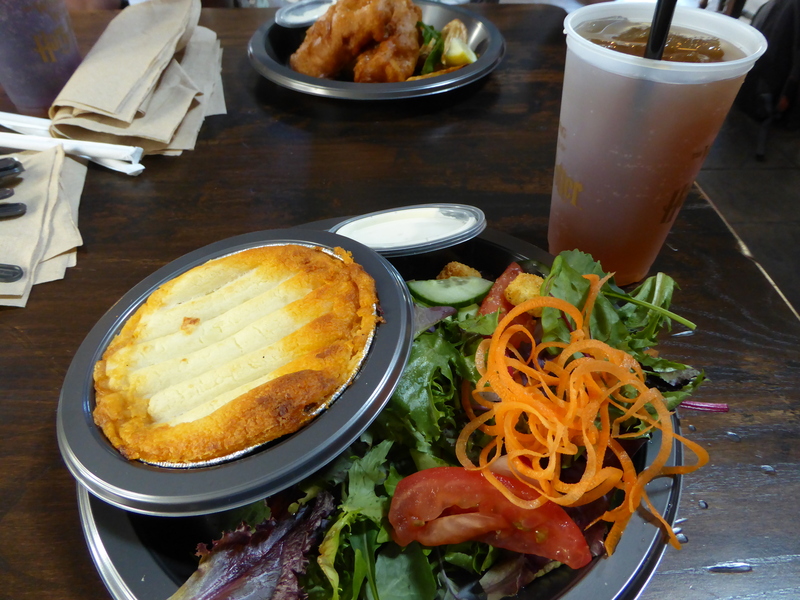 The food was good, the portions were good sized and filling, and we enjoyed sitting in the Three Broomsticks, soaking up the atmosphere. I just don’t want to go to the grocery store any more. I forced myself to go this morning as I needed to pick up some basics like milk and bread, as well as what was needed to make Youngest Daughter’s birthday cake. (She celebrated with friends yesterday and the family fun with cake is today) As I blasted through my local store, trying to get the agony over as fast as possible, I contemplated why I so dislike grocery shopping these days. Back when I first married, it was still a fairly new experience. The store was chock full of who knows what surprises. Also, I was working full time and ANY shopping was a delightful changes from the 8-5 grind. Once I had the girls, going to the grocery store by myself was the only alone time I had. Going with the little ones was a happy distraction for them and for me. Nowadays, when what work I do is primarily from home. going to the grocery store is just a chore that keeps me from doing what I want to do or what I need to do. Of course, I have also done it thousands of times by now, so it doesn’t have the feel of a new or unique experience. It doesn’t help that my local grocery store has cut way back on the number of products they carry and has replaced its store brand in many instances with a significantly inferior product. Having groceries delivered looks better and better to me. How do you feel about grocery shopping? Don’t mind it or is it an unwelcome chore? Everyone says Youngest Daughter looks like her sister. Her sister looks like me. But no one says Youngest looks like me. I know, it is all so puzzling, this family resemblance thing. 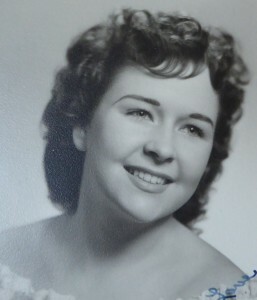 We always felt she looked like her Dad’s side of the family…maybe Then, when we were going through Hubby’s family photos after Mom in Law passed away, we figured it out. 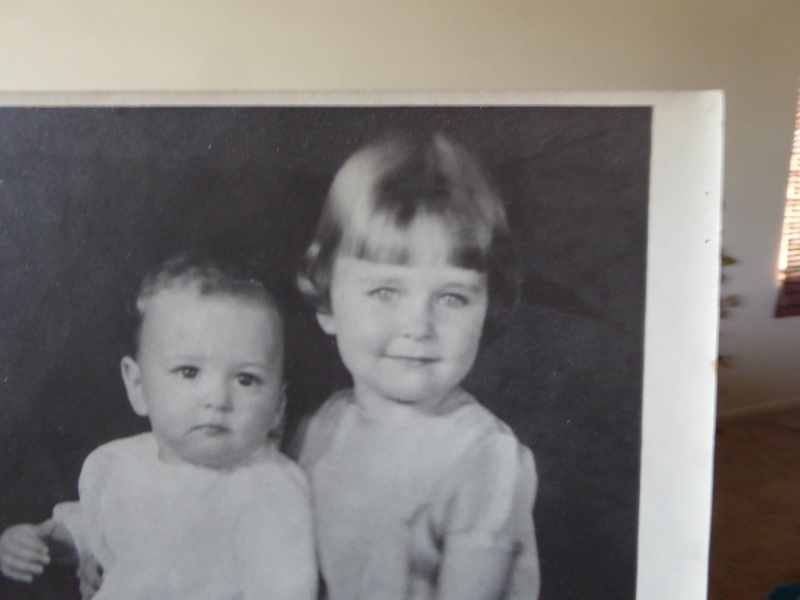 Youngest bears a strong family resemblance to her Great Aunt Carolyn, especially in those round cheeks. Isn’t DNA an amazing thing? 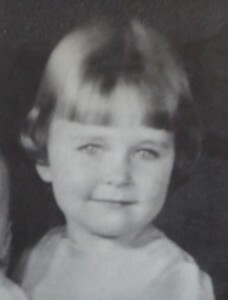 Aunt Carolyn as a little girl and Youngest in first grade. They even have the same bangs! The one thing Youngest got from me is fuller lips. 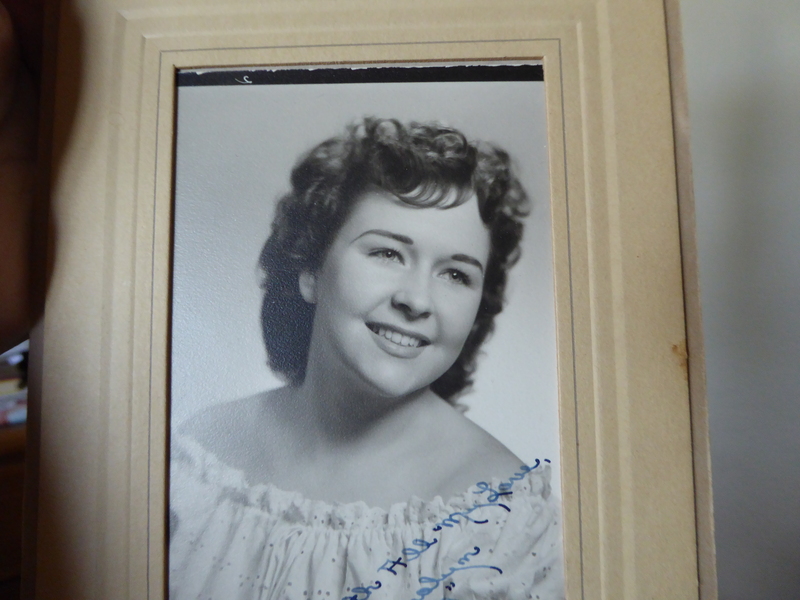 Aunt Carolyn’s high school graduation photo. 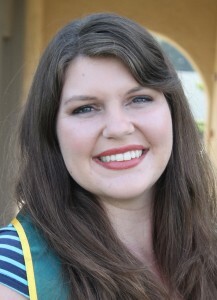 Youngest, just before college graduation. 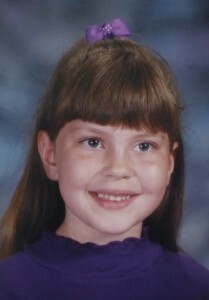 Youngest turns a quarter century old today. Wow! She came into our life in a split second. Two pushes and she was here! We were more experienced parents then, not so baffled by that thing called parenthood. And if there is anything like reincarnation, Youngest would make me believe, because she arrived and she was ours and it was like she was always here, just the person who we had been waiting for to complete our lives and family. 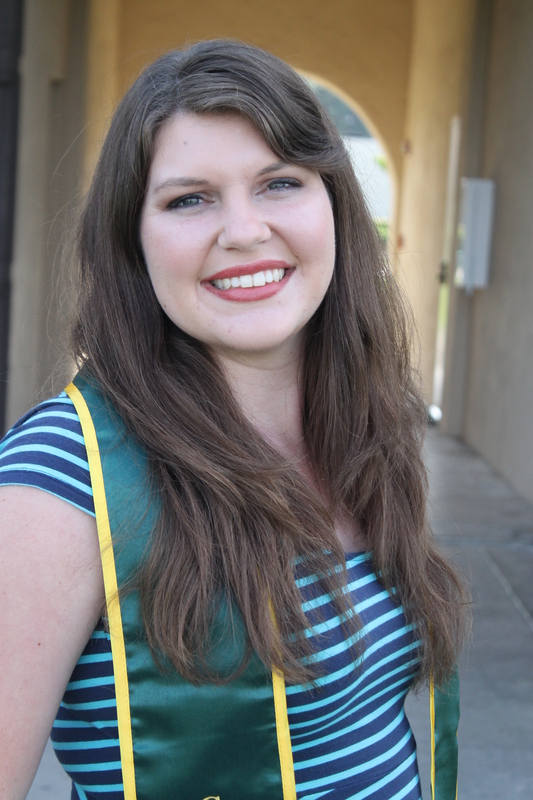 When the girls were around 12 years old, Eldest Daughter said she would be happy to live someplace else other than California as long as it didn’t have humidity, snow, or bugs. I laughed and said, “You just described California. Guess you will be staying here.” It is true we don’t have much snow or humidity, but, of course, we have bugs. However, here in inland So Cal, we do live in a desert, and the amount and variety of bugs is less than you find in a moister climate. They are EVERYWHERE and such a nuisance!! San Diego has them big time too! They were all over school today too! Even in the library! Glad we are not the only ones. They are driving me buggy – no pun intended. So, I was glad to know it wasn’t just me. I went to Subway to pick up dinner tonight and they were there, too. I hoped one didn’t get in my sandwich, but, as a friend pointed out, the gnats would have been flying around my food if I had prepared dinner. It wasn’t like Subway had a hygiene problem. It is impossible to keep the gnats out. We are assuming the gnats are due to all the rain we had. As someone said, gnats now or no water for showers next summer. Good point, Excuse me while I wave one out of my face….again…..
Kodak developed the camera and film so we could take photos of cats, right? Or is it just the digital camera that was made for cat antics? What ever the case. based on what is on the internet and my own experiences, it is hard to resist taking photos of cats. I take more photos of them, by far, than my own family. Here are three recent ones. Nox was being all casual on the back of the couch. Lately, when Hubby comes home from over at Mom in Law’s house, the cats act like he has been strolling through fields of catnip. As you can see here. Lumos is loving Hubby’s shoes! Nothing makes me happier than seeing a content Blackie fast asleep. Don’t know how much longer the Old Man is going to be with us, so it is all about him being happy. 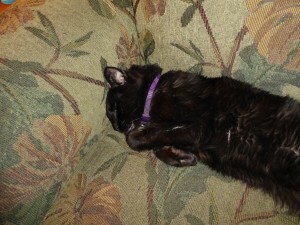 On this particular night, he was loving the couch.